Thomas Piketty Capital: How America’s liberals fell for a French economist. The French economist gives the American left a sturdy framework for its economic ideas. 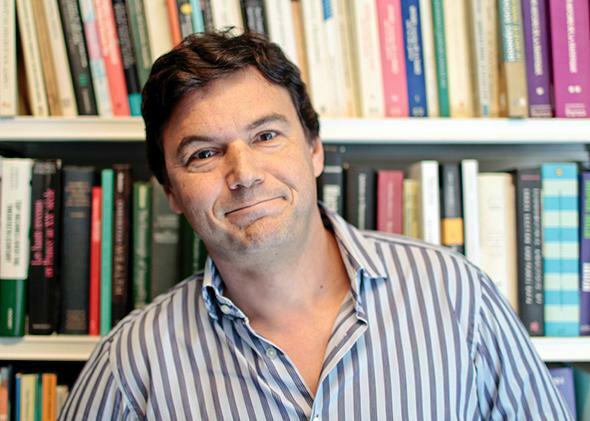 Thomas Piketty poses in his office in Paris on April 11, 2012. The economist may prove to be the most influential French thinker on America since Alexis de Tocqueville. But no, he is quite real. Capital in the Twenty-First Century, Piketty’s 685-page tome about the history and future of inequality, has improbably climbed to No. 1 on Amazon’s best-seller list. (The book’s title is only its first Marx allusion.) As of this writing, Capital is beating out such fare as the young adult hit The Fault in Our Stars and Michael Lewis’ Flash Boys. “The rock-star economist,” as New York magazine dubbed him, has also grabbed the interest of official Washington. While recently passing through D.C., he took a little time to meet with Treasury Secretary Jack Lew, the Council of Economic Advisers, and the IMF. Even Morning Joe, never exactly on the leading edge of ideas journalism, ran a segment about Capital Tuesday morning. I found out from my mother, who emailed to tell me the book sounded interesting. Perhaps this shouldn’t be surprising. Piketty, a professor at the Paris School of Economics, has been perhaps the most important thinker on inequality of the past decade or so. We can thank him and his various collaborators, including Berkeley’s Emmanuel Saez and Oxford’s Anthony Atkinson, for the research that uncovered the rise of the top 1 percent in both the U.S. and Europe. Now, with his book, he’s handed liberals a coherent framework that justifies the discomfort that they probably already felt about the wealth gap. Some argue we shouldn’t fret over inequality, because today’s global elite are the working, meritocratic rich: They earn their outsized pay thanks to their enormous technical and business talent. But Piketty’s research offers a simple retort. Today’s rich may have worked for their success, but tomorrow’s won’t have to. Already, Piketty argues, the very richest earn more income from their wealth than their labor. And just as the ruthless robber barons of the late 19th century gave way to F. Scott Fitzgerald’s boozing heirs and heiresses, today’s CEO’s and hedge fund managers will give way to a generation of children who simply won the birth lottery. In his must-read review of Capital in the New York Review of Books, Paul Krugman writes that Piketty is offering a “unified field theory of inequality, one that integrates economic growth, the distribution of income between capital and labor, and the distribution of wealth and income among individuals into a single frame.” This is part of the inherent appeal. Conservatives have long had an easy framework for their economic ideas: The free market cures all. Liberals, instead of nebulously arguing that they’re fighting for the middle class, now have a touchstone that clearly argues they’re fighting against the otherwise inevitable rise of the Hiltons. Capital will change the political conversation in a more subtle way as well, by focusing it on wealth, not income. Discussions about income can become very muddy, in part because Americans don’t like to begrudge a well-earned payday, and in part because it can be tricky to decide what should count as income. If you start adding health insurance and government transfers such as food stamps into the equation, as some do, the top 1 percent don’t dominate quite so severely. Wealth is a different story. Americans don’t like the idea of aristocrats—there’s a reason campaigning politicians bring up family farms and steel mills, not Shelter Island vacation homes, when they run for office. Moreover, you can’t save food stamps or a health plan, and because wealth only includes what you can save, it’s a measure of who wins in the economy over the long term. That’s what we ought to be fighting about. Whether or not Piketty’s grand unified theory is exactly correct, he’s moving the popular conversation in the right direction. I expect a Limbaugh tirade soon.